Don’t miss this great day visiting our neighbors to the south! We will head to Colorado Springs and enjoy a leisurely lunch at the world-famous Broadmoor Hotel and Resort. You will have some time to walk around the premise and enjoy the beautiful setting right at the base of Cheyenne Mountain. Afterward, we will head to Old Colorado City and stroll down the three block shopping area. It will be a lovely fall outing! Lunch is on your own. Please peruse the menu in your building’s book prior to signing up. If you cancel within 24 hours of this event, you will be responsible for a $5 cancellation fee; $10 if it is a 2 van event. Please sign up in the Birch dining room to be a part of this event. PG13 1995 Comedy In this wacky comedy, three New York drag queens (Wesley Snipes, Patrick Swayze and John Leguizamo) on their way to Hollywood for a beauty pageant get stranded in a small Midwestern town for the entire weekend when their car breaks down. While waiting for parts for their Cadillac convertible, the flamboyant trio shows the local homophobic rednecks that appearing different doesn’t mean they don’t have humanity in common. …No need to sign up. Just come and enjoy! Get the girls together for a great day of shopping! Castle Rock Outlet Mall is the largest open-air outlet center in the State of Colorado, where you’ll find over 100 name brand stores, including Coach, Ralph Lauren, Tommy Hilfiger, American Eagle, Osh Kosh and so many more! Lunch is on your own. If you cancel within 24 hours of this event, you will be responsible for a $5 cancellation fee; $10 if it is a 2 van event. Please sign up in the Birch dining room to be a part of this event. Come and participate in a bocce ball, ladder ball and corn hole tournament… You can choose to play any one of these and try your luck at the winning spot! If you have never played, come and watch and cheer your friends on! This will be a great way to spend a beautiful Colorado fall morning! No need to sign up, just come and cheer! Join Active Minds for a review of aviation in the United States. We will begin the story with the Wright Brothers and end with a look at the airline industry today, including the possibility of supersonic flights again in the not too distant future. In between, we’ll visit Charles Lindbergh, Amelia Earhart, aviation in the military, and the increased use of drone aircraft. RSVP by Tuesday, September 4 to be a part of this event. Come along with your friends and enjoy a yummy breakfast at one of the Littleton favorites! Several different kinds of pancakes along with omelets, egg breakfasts, benedicts and lots of other breakfast favorites are found on this varied menu. Join us! Breakfast is on your own. Please look at the menu in your building’s trip book to view the options before you sign up! If you cancel within 24 hours of the event, you will be responsible for a $5 cancellation fee; $10 if it is a 2-van event. Please sign up in the Birch dining room to be a part of this event. NR 1948 Classic Drama Wrapped in a classic tale of adventure, this Academy Award winner helmed by John Huston follows a trio of gold prospectors who set out to strike it rich and agree to split the take until paranoia and greed consumes one of them. Delivering superb performances as the three miners are Humphrey Bogart, Tim Holt and Walter Huston, who copped a Best Supporting Actor Oscar while son John scored statuettes for his direction and screenplay. No need to sign up, just come over and enjoy! It’s that time of year when we celebrate fall and everything good that comes with it! We invite you and your families to come and share an afternoon with friends and neighbors at a good, old-fashioned Oktoberfest meal! You will dine on brats, burgers, sauerkraut, potato salad and beer-of course! Bring your dancing shoes because the spectacular polka band, “The Austrian Connection”, will return for another rousing, great afternoon of song and dance! You may invite up to 4 family members! Talk with your families early so that you can meet this deadline! Please impress upon your family the importance of getting back to you before the deadline so that you can sit with your building and not at the Late Sign-Up seating. Deadline to sign up is Friday, August 31. You MUST sign up in YOUR building’s RSVP book to be a part of this event. Please mark 1 for yourself, then the number of guests you are bringing and put the total number attending in the last column. Sign up on time…so that RISA CAN PURCHASE ENOUGH FOOD FOR EVERYONE. WHEN YOU SIGN UP LATE, YOU FORFEIT GETTING TO EAT W/YOUR GROUP OF FRIENDS DURING YOUR BUILDING’S SEATING TIME. LATE SEATING WILL BE AT 1:00pm, IF THERE IS FOOD LEFT OVER. There will be no tickets. YOUR NAME AND NUMBER OF GUESTS WILL BE CHECKED OFF! IF YOU DON’T MEET THE SIGN-UP DEADLINE, YOU WILL NOT BE ALLOWED TO SIT AT YOUR BUILDING’S TIME AND WILL HAVE TO RETURN AT THE LATE SEATING TIME. Please don’t put yourself or your family in the precarious position of showing up and not having signed up on time!!! PRE-PLAN!!! Do NOT arrive more than 15 minutes early. TABLES WILL BE ROPED OFF AND YOU WILL NOT BE ABLE TO SIT DOWN UNTIL 15 MINUTES BEFORE YOUR RESPECTIVE SEATING TIMES. First seating will be at 11:30am for Cedar, second seating at 12:00pm for Aspen, and a 3rd seating at 12:30 for Birch and Cottages. (The order is done by the previous year’s schedule.) We are expecting 350 people at this event…please adhere to these separate seating times by building; separate seatings are so that we can accommodate the amount of people we are expecting in a timely manner! The band will play until 1:30pm. When you arrive, go find a seat and relax. You will be called up by table by a staff member. Please do not enter the food line until you’ve been called. What a great way to see Colorado’s beautiful early Fall and one of the most beautiful areas with incredible rock formations. We will watch an informative film at the visitor center before heading out in our van with a guide to show us around the Garden. This is a fabulous opportunity to see the beauty and grandeur of Colorado up close and personal! The guide will give us information on the geology of the park as well as some history of the area. There is a café on the premise where we will enjoy lunch after the tour. You can either purchase a hamburger, hot dog etc… or pack your lunch to enjoy after the tour. $12 will be charged to your account for the movie and guided tour. Lunch is on your own either packed or purchased. If you cancel and we cannot find a replacement, you will be responsible for $12. If you cancel within 24 hours of the event, you will also be responsible for a $5 cancellation fee; $10 if it is a 2 van event. Please sign up in the Birch dining room to be a part of this event. Brian returns from a busy summer at Central City Opera! His menu will consist of bacon wrapped pork tenderloin, fennel salad, peach salsa and chocolate bark…each part of the meal having five or less ingredients…easy to make in your own home! $10 will be charged to your account for your lunch. If you cancel and we cannot find a replacement, you will be responsible for $10. Please sign up in the Birch dining room to be a part of this event. NR 1959 Classic Comedy When musicians Jerry and Joe accidentally witness the St. Valentine’s day Massacre, they get out of town the only way they know how – dressed as women. But things heat up on the road when they meet a curvy blond who plays the ukulele. Cast: Marilyn Monroe, Tony Curtis, Jack Lemmon. … No need to sign up. Just come and enjoy! Duo Classica is praised for exquisitely poetic sonority, powerful and expressive execution, extraordinary precision, and dazzling virtuosity, DuoClassica includes violinist Lydia Sviatlovskaya and pianist Olga Dashevskaya. Romantic Encores features some of the most dazzling pieces from the romantic violin repertoire written by great virtuosos H. Wieniawski and F. Kreisler. This concert includes pieces inspired by brilliant tunes written by other composers: Wieniawski’s “Faust;” “Gypsy Caprice” and “Tzigane” by Kreisler, and “Hungarian Dances” by J. Brahms, among others. $19 will be charged to your account. If you cancel and we cannot find a replacement, you will be responsible for $19. If you cancel within 24 hours of the event, you will also be responsible for a $5 cancellation fee; $10 if it is a 2 van event. Please sign up in the Birch dining room to be a part of this event. 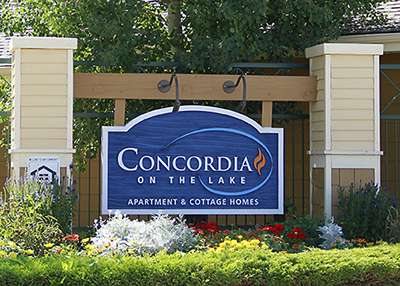 If you are a Birch resident, please come to meet Mark Osweiler, Concordia’s General Manager! He will be in the Birch common area to get to know each Birch resident and answer any questions or concerns you may have. RSVP in the Birch on campus book to be a part of this event by Tuesday, September 11. The Good Samaritan Shelter is part of the Catholic Charities of America and is located downtown. It is both a long term home for women and an emergency shelter for women with substance abuse and addiction. We will be serving a meal and possibly doing some light housekeeping in the long term stay shelter. Because this is a little different than any of our other volunteer opportunities, I will be personally asking a small few to volunteer for this maiden voyage and we will check out the layout for the next time we go. Come and enjoy a nice fall day at the beautiful Botanic Gardens! You can stroll through the rose garden, Monet’s lily pond, the Japanese garden, the tropical atrium and much, much more! There are places to sit down along the way! If there is room and you do not have a pen pal, you are welcome to go with us! We will eat lunch there, please pack a lunch to eat with your penpal. $9.50 will be charged for your ticket and lunch is on your own. If you cancel, you will be responsible for $9.50. If you cancel within 24 hours of the event, you will also be responsible for a $5 cancellation fee; $10 if it is a 2 van event. In this informative program, attendees will be empowered by learning about the latest information, research, and breakthrough programs for Alzheimer’s that most medical professionals are unaware of. The program will include an overview of Anew Life Center’s Alzheimer’s program that allows individuals to prevent and recover from the early stages of this disease. They will also learn some common sense, nonmedical options they can start to apply in their life, right now. Attendees will leave informed with a feeling of hope and confidence knowing Alzheimer’s is a preventable disease. RSVP in your building’s book by Tuesday, September 11 to be a part of this event. Enjoy a beautiful, Colorado, autumn day in our Rockies! We will enjoy a stroll through Vail village where you will be able to shop on your own for a couple of hours. We will eat as a group at Pepi’s, a European restaurant. Don’t miss this wonderful day in the mountains!! There must be 8 signed up to go on this event. Lunch is on your own. $10 will be charged to your account for transportation. If you cancel and we cannot find a replacement, you will be responsible for $10. If you cancel within 24 hours of the event, you will also be responsible for a $5 cancellation fee; $10 if it is a 2-van event. Please sign up in the Birch dining room to be a part of this event. NR 1951 Classic Drama… Charlie Allnut (Humphrey Bogart), the booze-guzzling, rough-hewn captain of a broken-down East African riverboat, teams with a straitlaced, iron-willed missionary (Katharine Hepburn) to take on a menacing German gunboat during World War I. No need to sign up, just come and enjoy! Come and enjoy a beautiful drive into the mountains and a lovely brunch up in the restaurant of the Evergreen Golf Course! Talk your friends and neighbors into enjoying a nice fall Sunday in the foothills while eating a yummy brunch! The menu consists of different takes on Eggs Benedict, breakfast burrito, huevos rancheros, biscuits and gravy, French toast, an egg breakfast, build your own omelets and much more! Please peruse the menu in your building’s book prior to signing up. Brunch is on your own. If you cancel within 24 hours of the event, you will be responsible for a $5 cancellation fee; $10 if it is a 2 van event. Please sign up in the Birch dining room to be a part of this event. The Hawaiian Islands are the exposed peaks of a great undersea mountain range, formed by volcanic activity over a hotspot in the Earth’s mantle. Explore each of the 8 main islands with Chris – who lived and taught school in Hawaii for 4 years – as she shares her stories and photography. The views, culture and experiences are breathtaking! Aloha! RSVP by Friday, September 14 to bea part of this event. Don’t miss this fun excursion to Pueblo! We will head about a couple hours south of Concordia to see this beautiful mansion they have made into a museum. Built in 1893, this 37-room mansion was home to the John A. and Margaret Thatcher family and named for Mrs. Thatcher’s favorite flower. It remained a family residence for 75 years. Designed by noted New York architect Henry Hudson Holly and two years under construction, the mansion was completed in 1893. Nearly all furnishings, accessories, decorative arts, paintings, custom paneling, wall and window treatments are original to the home. There is a very small elevator that can fit 2 but most of us will use the large staircases throughout the mansion. The tour is about an hour long. Afterward, we will head to The Gold Dust Inn to enjoy a very casual lunch. Please peruse the menu in your building’s book prior to signing up. Lunch is on your own. $5 will be charged for the tour of the mansion museum. If you cancel and we cannot find a replacement, you will be responsible for $5. If you cancel within 24 hours of the event, you will also be responsible for a $5 cancellation fee; $10 if it is a 2 van event. Please sign up in the Birch dining room to be a part of this event. PG13 1982 Drama 1Hr 59M Michael Dorsey (Dustin Hoffman) transforms himself into a woman to pr0ve he can get hired on a soap opera. But Michael has an enviable problem when his alter ego, Dorothy, becomes daytime television’s hottest ticket. Cast: Dustin Hoffman, Jessica Lange, Teri Garr… No need to sign up, just come and enjoy! This will be fun! We will be able to compare Lamont’s Wind Ensemble with CU Boulder’s Wind Ensemble performing in a beautiful venue… Macky Auditorium! Although we are blessed and spoiled by hearing Lamont’s fabulous ensembles, CU Boulder’s are equally as wonderful, just a little further away! We will travel to the Boulder campus an hour or so away to enjoy this concert. Composed of the most outstanding wind, brass and percussion students in the College of Music, the Wind Symphony is dedicated to performing the finest wind repertoire in performance at Macky Auditorium. The Symphonic Band, which is comprised of 70 of the finest wind, brass and percussion performers on campus, performs a variety of outstanding works written for band. This concert is FREE. If you cancel within 24 hours of the event, you will be responsible for a $5 cancellation fee; $10 if it is a 2 van event. Please sign up in the Birch dining room to be a part of this event. Don’t miss this great day in our Colorado Mountains! We will drive an hour into our mountains to the town of Wondervu and enjoy a casual lunch at Wondervu Café! On the way, we hope to view beautiful Aspen trees turning the luscious gold that Colorado falls are made of! The menu consists of many Mexican favorites along with burgers, sandwiches and salads! Please peruse the menu in your building’s book before you sign up. Lunch is on your own. If you cancel within 24 hours of the event, you will be responsible for a $5 cancellation fee; $10 if it is a 2-van event. Please sign up in the Birch dining room to be a part of this event. NR 1941 Classic Drama Humphrey Bogart stars as private eye Sam Spade in this Oscar-nominated noir classic that finds the sultry Miss Wonderly (Mary Astor) seeking out protection from a man named Thursby. Spade’s partner (Jerome Cowan) takes the case- but he winds up dead, along with Thursby. Spade’s subsequent hunt for the killer leads him into a world of deception and double-crossing, as a trio of criminals searches for a priceless statue known as the Maltese Falcon. … No need to sign up, just come and enjoy! Don’t miss this fabulous event! Ella Fitzgerald and Frank Sinatra were two undisputed masters of “The Great American Songbook.” During their storied careers, they appeared together several times on television and on stage. Great fans of one another’s work, their mutual admiration transformed into pure magic when performing together. Sadly, they never realized a recording immortalizing their collaborative legacy. Join your Colorado Symphony and special guest artists Capathia Jenkins and Tony DeSare as we work to recreate some of that magic live for one night only this September. $45.00 will be charged to your account for rear orchestra tickets. If you cancel and we cannot find a replacement, you will be responsible for $45.00. If you cancel within 24 hours of the event, you will also be responsible for a $5 cancellation fee; $10 if it is a 2 van event. Please sign up in the Birch dining room to be a part of this event. Don’t miss this great opportunity to view the beauty of Colorado and fall colors as we drive up one of Colorado’s fourteeners! We will hopefully see wildlife and beautiful Colorado aspens! After, we will have lunch at the Echo Lake Lodge at the base of Mt. Evans where you have a wide variety of lunch items to choose from. Lunch is on your own. If you cancel within 24 hours of the event, you will also be responsible for a $5 cancellation fee; $10 if it is a 2-van event. Please sign up in the Birch dining room to be a part of this event. Come and join us for a wonderful afternoon and evening in Estes Park and Rocky Mountain National Park to see the elk! We will visit the quaint town of Estes Park first and shop in the shops before heading to the park where a National Parks ranger guide will get on our bus and give us a guided tour of the park and take us to see the Elk in their natural habitat! Please grab lunch before you board the bus and pack a sack dinner to eat as we travel throughout the park. $25 will be charged to your account for the step on guide and transportation to Estes Park. If you cancel and we cannot find a replacement, you will be responsible for $25. If you cancel within 24 hours of the event, you will also be responsible for a $5 cancellation fee; $10 if it is a 2 van event. Please sign up in the Birch dining room to be a part of this event. PG13 1993 Comedy Drama Loving but irresponsible dad Daniel Hillard (Robin Williams), estranged from his exasperated spouse (Sally Field), is crushed by a court order allowing only weekly visits with his kids. When Daniel learns his ex needs a housekeeper, he gets the job – disguised as an English Nanny. Soon he becomes not only his children’s best pal but the kind of parent he should have been from the start. Not surprisingly, the film won an Oscar for Best Makeup.… No need to sign up, just come and enjoy. Come enjoy a good, old-fashioned meal just like Mama used to cook! The senior menu includes choices from pot roast, turkey dinner, meatloaf dinner, baked fish, chicken-fried steak dinner, fried chicken dinner and much, much more! Dinner is on your own. If you cancel within 24 hours of the event, you will be responsible for a cancellation fee of $5; $10 if it is a 2 van event. Please sign up in the Birch dining room to be a part of this event. Don’t miss this opportunity to spend time with friends and neighbors while enjoying some treats! Come and unwind in the company of old friends and new! This is a great way to meet people in the community! Come join in the fun!! Please RSVP in your building’s book to be a part of this event by Tuesday, September 25. This wonderful buffet style Italian market has gourmet Italian fare at a very inexpensive price. You will be able to pick from several fresh pizza choices, pasta dishes, baked chicken, eggplant parmesan, salads, vegetables, baked fish and many scrumptious desserts! Lunch is on your own at $8.99 for the buffet plus drink, tax and tip. Come and enjoy a nice fall day with your friends and neighbors! If you cancel within 24 hours of the event, you will also be responsible for a $5 cancellation fee; $10 if it is a 2-van event. Please sign up in the Birch dining room to be a part of this event. PG-13….1942 Classic Drama In this Oscar-winning classic, American expat Rick Blaine (Humprey Bogart) plays host to gamblers, thieves, and refugees at his Moroccan nightclub during World War II…but he never expected Ilsa (Ingrid Bergman) – the woman who broke his heart – to walk through that door. Ilsa hopes that with Rick’s help, she and her fugitive husband (Paul Henreid) can escape to America. But the spark that brought the lovers together still burns brightly.…No need to sign up, just come and enjoy!